Greek Philosophers Plato and Aristotle – To understand Human Nature, we must know the Human Form, its actions and behavior. What is man? The motivation to ask this question comes from a statement expressed in Sanskrit language, ‘Sarvesham Swastir Bhavatu’, which seeks the well-being of all humans, of all races, of all cultures, of all religions, and of all nations. Our efforts to support the well-being of man would be affected by our understanding the ‘real’ or ‘true’ nature of man. Aristotle describes corporeal substances are composite of two principles, form and matter. It is important to seek proper understanding of human form and to know the truth about human nature by describing the form. Being born relates man to the Subjective Reality of his physical existence and human nature is related to the fact of man’s existence in the physical world and universe. If the Objective Reality of man is non-material, we still need to know as to what exists in the world, and as to how it exists. Greek philosopher Plato ( 427 B.C. to 347 B.C. ) describes human nature by his Theory of Forms. He describes four aspects of human being; 1. The Logical Form, 2. The Epistemological Form, 3. The Moral Form, and 4. The Metaphysical Form. The Logical Form : It describes the physical being, the physical form and its identity. Each human being has characteristic physical features using which he can be identified as a member of the genus Homo and he has very specific features that establishes his identity that is shared by all the members of a species known as Homo sapiens sapiens. Each member of this species could be further identified as an individual using the present Identification technology. This specific human individual will not exist with the same identifying features during his entire duration of his physical existence. The Logical Form of human is impermanent and is subject to change and eventual death. However, the existence of this physical form is important to support the existence of man and to know his nature. Existence precedes human nature or Essence. The Essence ( Who You Are ) is defined and is preceded by the Reality of Existence. The human being belongs to a social group, and always exists as an Individual with Individuality while his physical form changes and passes through various stages such as infancy, boyhood, teenage, adult and old age. The Logical Form is subject to change, decay, and death. Hence, the reality of this Form is often doubted. It must be noted that Plato has not known man as a multicellular organism and his description of the Logical Form is not based upon study of Human Anatomy and Human Physiology. The Epistemological Form : The term epistemology deals with the Theory of Knowledge. It describes the possible kinds of knowledge and the degrees of certainty for each kind of knowledge. Plato describes the knowledge that human being can acquire through education, a process of learning from sensory experiences, and teaching imparted by others. 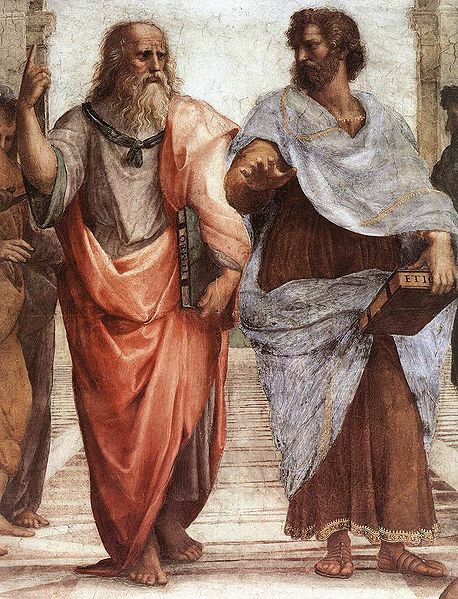 Plato expects to obtain full knowledge of human forms through proper education. Such knowledge is important to know the Metaphysical Form of man. Self-Knowledge leads to the understanding of man’s true or real nature. The perception of impermanent, material, human body is described by Plato as only opinion or belief and he considers that such perception is not true knowledge of human form. Plato has not given attention to knowledge that is innate or that is not acquired by the learning process. To perform the living functions in support of his existence, man uses biological information that is inherited and not knowledge that has to be acquired through learning. The Moral Form : It describes qualities such as Courage and Justice, the observable aspects of human nature that could be described from human action and human behavior. The Metaphysical Form : Plato claims that the Metaphysical Form is not perceivable by any of the senses. The Metaphysical Form is the real form of the human being as compared to the Logical Form which is considered to be unreal. The Metaphysical Form is not present in space or time, as it is beyond the world of changeable and destructible things. It belongs to the realm of unchanging, eternal forms. This form being true can be fully known through knowledge. Plato divides human being into two categories; 1. Body – a material entity, and 2. Mind or Soul – a non-material entity which can exist apart from the Body. Plato maintains that the Mind or Soul is indestructible, it existed eternally before birth and will exist eternally after death. He further describes the three parts of Soul as 1. Appetite – the seat of desires and passion such as hunger, thirst, and sexual desire, 2. Reason – the seat of discernment that chooses right from wrong and makes distinctions between good and evil, and 3. Spirit – the seat of self-assertion, self-interest, anger, indignation, and self-pride. Plato considers that the well-being of man depends upon harmonious interactions of the three aspects of the Soul. Plato thinks that such harmonious interactions would only be possible when Reason controls both Spirit and Appetite. To strike this balance and to maintain harmony, man has to obtain knowledge of the eternal, unchanging form. Plato thinks that Justice is revealed as a principle of each thing performing the function most appropriate to its nature, a principle of the proper adjudication of activity and being. The principle of Justice is revealed or discovered in the individual human Soul when each part of the Soul performs its proper and appropriate function. Plato believed that the Human Soul rules the Human Body. The Rule of Reason is required to combine the virtue of temperance with self-mastery and harmony results when all elements agree as to which should do what. I describe five Forms of human being and each Form can be identified by its own behavior;1. The Physical Form as described by Human Anatomy and Human Physiology, 2. The Mental Form as described by sciences such as Psychology and Psychiatry, the Form that has intellectual and emotional aspects, 3. The Social Form as described by Social Sciences, the social aspects of man, his activities, and the structure and organization of all human institutions, 4. The Moral Form as described by man’s power of discernment or conscience to make moral and ethical choices, and 5, The Spiritual Form, the aspect that formulates harmonious interactions between the cells, the tissues, and the organs of the human body whose individual functions support the well-being of man. Man’s existence would be at risk if any of these five aspects is adversely impacted. Unless we seek clear, visual images of Human Form in all its aspects, we will fail to understand man and his purpose in life. Pingback: Are You an Old Soul? « An Alchemist's Journey…. Pingback: SPIRITUALISM – HUMAN EXISTENCE AND HUMAN NATURE | Bhavanajagat. Pingback: SPIRITUALISM – PSYCHOANALYSIS AND HUMAN NATURE | Bhavanajagat. Pingback: SPIRITUALISM – THE UNITY OF MAN IN BODY, MIND, AND SOUL | Bhavanajagat. Pingback: SPIRITUALISM – SPIRITUAL BEING AND SELF-REALIZATION | Bhavanajagat. Pingback: SPIRITUALISM – THE POSITIVE SCIENCE OF SPIRITUALITY | Bhavanajagat.